Dr. Edward Stepanenkov DMD is a Dentist in Madison, Wisconsin providing general, restorative and cosmetic dentistry. Discover how Dr. Stepanenkov can improve your smile by viewing our dental services and smile gallery. Schedule your free consultation or dental appointment by calling (608) 268-1700. 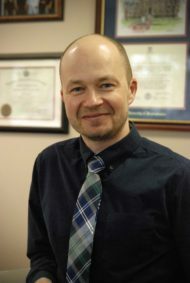 Dr. Stepanenkov graduated from the University of Pennsylvania School of Dental Medicine (Penn Dental). After obtaining advanced general practice residency training at the University of Minnesota (UMN Dental) he has been practicing in the Madison area since 2001. Dr. Stepanenkov’s goal is to serve you in the best professional manner possible. One of the ways he provides that level of service is his dedication to quality continuing education throughout his professional career. He is a graduate of the Misch International Implant Institute (MIII). Dr. Stepanenkov is an active member of the Academy of General Dentistry (AGD), International College of Oral Implantologists (ICOI), Academy of Dentistry International (ADI). The doctor also holds fellowships in the Academy of Dentistry International (ADI) and the International College of Oral Implantologists (ICOI). Dr. Stepanenkov is wonderful. Very professional and knowledgeable. He has taken time to make sure everything was just right. His staff is very friendly and helpful as well. He takes the time to explain everything he is doing and how it all works. Thanks for the great smile Dr. Stepanenkov. I had a root canal done that was long overdue and infected. Dr. Ed was excellent in all respects; from getting me in right away, to explaining the treatment, to the follow-up by both him and his staff! I would and will recommend Radiant Smile Dentistry to anyone and everyone I know! Thank you so very much for the incredible service! He gave me all options,and his details on the work to be performed. Followed through with all work and checked on me afterwards. Everyone was very friendly from reception to the doctor himself. The procedure was performed in a very efficient manner, without sacrificing quality of care. It was evident my comfort and well being were priority #1! © 2015 - Copyright Radiant Smile Dentistry - All Rights Reserved.